There are a number of NOS DACs on the market, including offerings from Scott Nixon, Ack! Industries, Teradak Audio, MHDT Labs, Lavry, DIY Paradise, Pacific Valve and others. 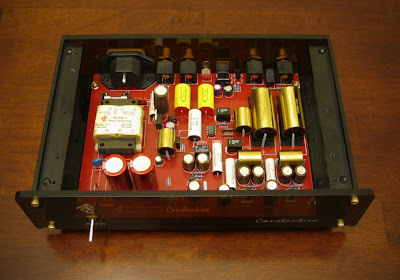 I would argue that the Taiwanese company MHDT is one of the most well known makers of NOS DACs. They've offered a number of different levels of DACs, including the Digital Renaissance, Constantine, Paradisea and Havana, some with tubes, some without. 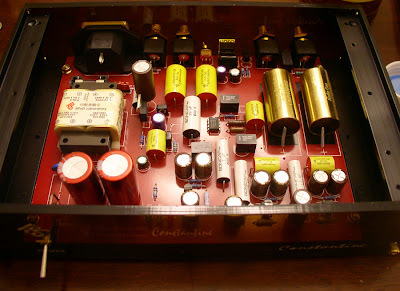 The MHDT Constantine is solid state, meaning it doesn't include tubes, and is an excellent value if you can find one on Audiogon. 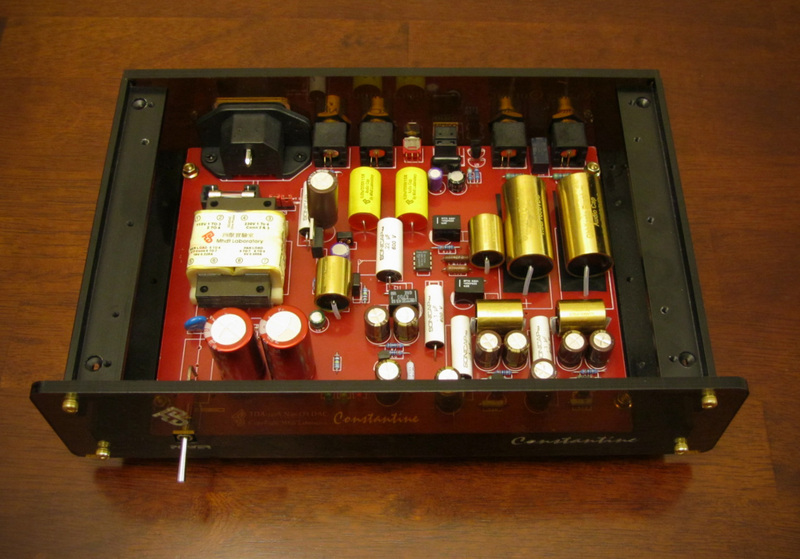 They typically sell used for $200-250 and would make an excellent introduction to non-oversampling DACs. With a few tweaks, I was able to eek out a little bit more detail while maintaining the same character of the DAC. There are a few slots on the board for film bypass caps that hadn't been taken advantage of, so Sonicaps were used, along with a couple other places where they would fit. Two of the original Elna Silmic caps were in the way of the capacitors, so they had to be removed and replaced with longer legged Silmics (with teflon tubing preventing any shorts). The BNC was replaced with a Vampire BNC and the output caps were swapped in favor of gold Obbligatos. Both the Sonicaps and Obbligatos are well known values in the world of film caps. 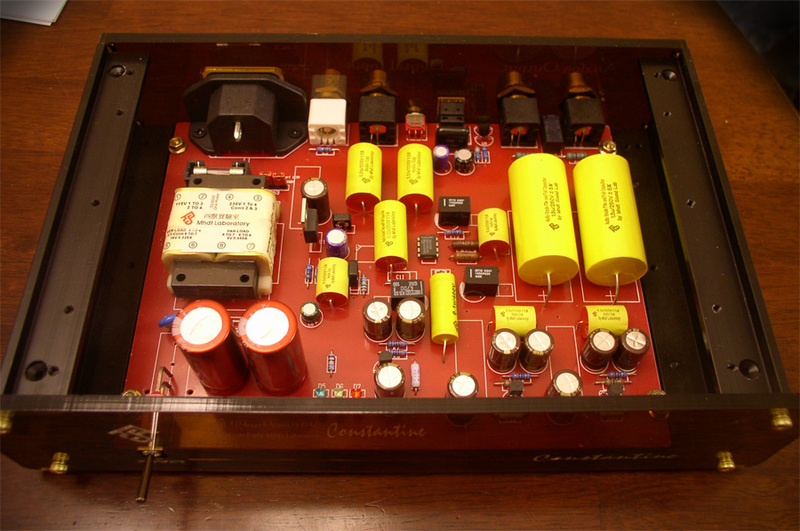 You'll find a rundown here on the famous Humble Homemade HiFi Capacitor Test. UPDATE (5/16/2011): While I was modding my MHDT Paradisea, I decided to go ahead and replace the four 0.10uF stock caps in the Constantine with Obbligatos. A little bit of drilling of the soldering eyelets was required for the thick leads. Luckily, the Constantine board is one sided and I didn't have to worry about the conductive shells of the Obbligatos touching any traces. I did opt to add teflon sleeving to the leads so that they wouldn't short across the shell though. Please remember that modifications can be dangerous to you and/or your surroundings and should only be performed by a certified technician. The owner of this blog and all associated parties can not / will not be held responsible if you attempt a posted modification and cause physical harm to yourself or your surroundings. Many electronics contain high voltages that can kill, and mods, if performed improperly, can be a fire hazard. Please keep this in mind. Nice. I have a Constantine and would like to know if you offer this modifications or could recommend someone. Thanks!